Store BLOG of Shadows: New teas! We've just gotten in a beautiful new series of Zodiac blooming teas, as well as a few other tasty teas! We have blooming teas for all twelve signs, each of them with special properties fitting the zodiacal sign attributes. They are lovely to see and very tasty! Take a look below! Personality: Quiet, shy, ambitious, and sharp. Ingredients: Jasmine green tea and carnation flower. Functions: Relieves stress, improves body metabolism and blood circulation. Personality: Attractive, affectionate, and artistic. Functions: Helps cure coprostasis and relieve stress. Personality: Systematic, understanding, and imaginative. 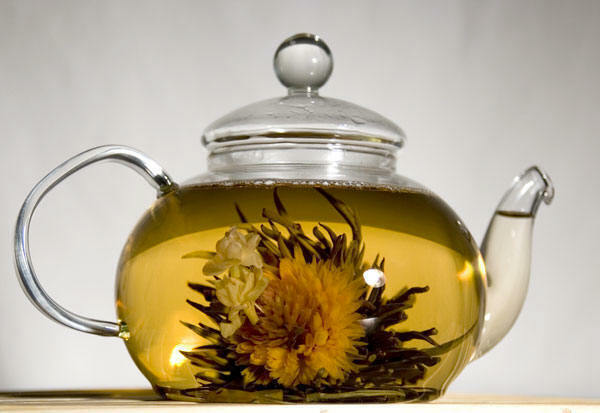 Ingredients: Jasmine green tea, globe amaranth, and jasmine flowers. Functions: Eliminates body toxins and maintains emotional balance. Personality: Hard-working, smart, sensitive, and loyal. Ingredients: Jasmine green tea, chrysanthemum, and jasmine flowers. Functions: Reduces internal heat, and cleanses grease and impurities. We have Ginseng Oolong, Milk Oolong and Red Lychee loose teas as well. Not only are they yummy in the tummy, but they also have interesting health benefits. Lower blood pressure and cholesterol, aid with indigestion, immune-system boost, anti-carcinogen, heart disease preventative, strengthening against stress and fatigue. Immune boost, antitoxin and anticarcinogen, helps fight disease and aging, reduces cholesterol, aids in weight loss. Immune boost, healthy skin, improved blood circulation, lowers blood pressure.